This winter resident is fairly easy to identify with their rusty cap, black breast spot, and fairly long tail. They are the most abundant sparrow found at Goose Pond in the winter. After winter, these sparrows fly north to their breeding grounds in the tundra. We are not sure why they are called “tree” sparrows. In winter they are found in open areas at Goose Pond and they nest in the tundra in areas with scattered shrubs. 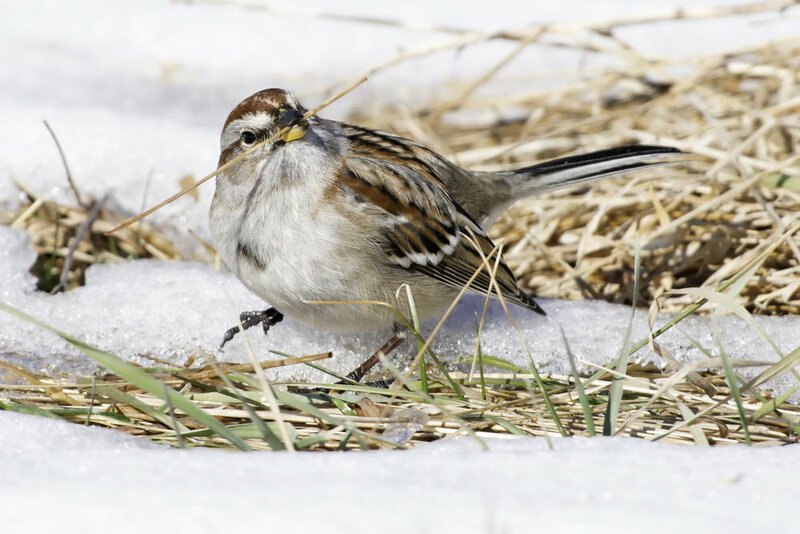 American tree sparrows are often found in small flocks on the ground, feeding on weed seeds. They frequently are found feeding with dark-eyed juncos along roadsides, in open fields, and at bird feeders. Along roadsides they are feeding on annual foxtail seeds that result from the June roadside mowing which favors the growth of foxtail grass. The mowing and winters snow plowing leaves a disturbed area adjacent to the pavement providing ideal habitat for foxtail seed to germinate. We have been feeding birds at our feeders since 1979 and provide a constant supply of mixed birdseed (sunflower, millet, and cracked corn) spread onto the ground in several locations. Goose Pond Sanctuary is an ideal location for this winter species. On the December Christmas Bird Count, Mark and his party only counted 19 tree sparrows at the feeders at the two residences. Usually over 100 tree sparrows are present at the feeders however we were not surprised at their low numbers. We thought the volunteers counting in the seven acre food plot would find good numbers of tree sparrows, and they did not disappoint us when they reported 132 tree sparrows. The food plot contains an abundance of foxtail and sorghum seeds. Maia Persche, with assistance by Jim Otto, surveyed the food plot weekly beginning August 18th. Tree sparrows arrived in late October and their numbers increased to 173 individuals on November 9th. From November 9 through January 22, the weekly count ranged between 125 and 323 tree sparrows with an average weekly count of 193. It will be interesting to track their numbers for the rest of winter and to see when they begin their migration north. We are looking forward to the Great Backyard Bird Count that is being held on February 17-20th. To participate and also to check results go to http://gbbc.birdcount.org. This bird count helps scientists to better investigate migration trends, distribution, and habitat, and you get to learn more about the birds in your area. Don’t have a backyard? The Great Backyard Bird Count can be done in a park or local neighborhood area. Tree sparrows should be easy to find in the right habitats since Partners in Flight estimates the breeding population of American Tree Sparrow at 20 million, with 87% spending some part of the winter south of the Canadian border.